After attending his first Esri International User Conference, Alfred Drenth, GIS specialist, Waterschap Noorderzijlvest, took his family, bike, and T-shirt to the south of France to go camping. 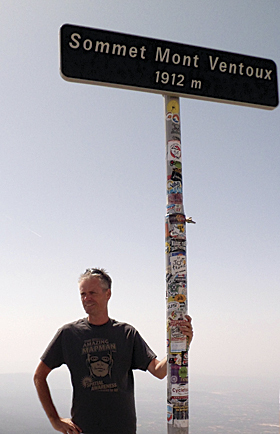 He went up Mount Ventoux by bike, and at the top, he showed the world his new MapMan T-shirt. 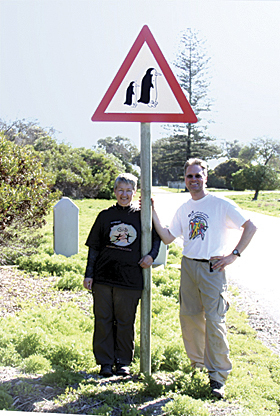 Kathryn Scott and Brian Hall, GIS analysts for Washington State, posed with their Esri T-shirts at a penguin crossing on Robben Island, off the coast of South Africa. They were volunteers for a research project conducted at the penguin breeding colony on the island. Herrick A. (H.A.) 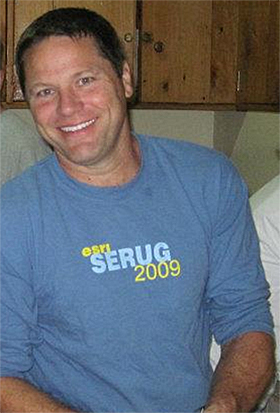 Smith, Nease High School, Ponte Verde, Florida, is seen here wearing an Esri SERUG 2009 shirt while washing dishes at a camp for Nicaraguan youth (Vida Joven) near Jinotega, Nicaragua.